The Acid Subculture Cigars offers a great line of flavored premium cigars that have grown into one of the top selling brands in today's cigar market. Both the Acid Toast and Windy City are hand-rolled premium cigars that give their user a perfect consistency and flawless smoke. Each are bound with either US Connecticut Broadleaf or Cameroon wrappers. Top them off with infused essential oils, herbs, and botanicals with the finest long filler Nicaraguan tobaccos. 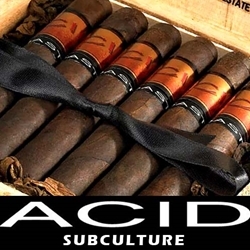 Acid Subculture Cigars are great for any smoker and are too good to pass up.